Shiny old army boots, without a care for the scorching heat. Kwandonga ziyaduma, kwamntanam wendele phi, kwanyama ayipheli kuphela izinyo lendoda! which I must say took my breath away when they were finished. how nice her land was through her crop and its bearings. up, up, up till it disappeared somewhere halfway up her skirts. for the men to take with as they left early with the horses to Ebisho. bumping against sweaty mama’s in the hot summer heat. that scratches and scribbles, jotting down this and that. from the mountains I loved. and every now and again a blanket, an attribute of her Sotho origins. I would picture myself with a big chunk of tender lamb and rice in my plate. where we stayed with mama as she worked at Glen Grey hospital. From the dreaded disease called cultural imibhiyozo deprivation. that offered us its meat which never failed to warm our hungry tummies. My grandpa always slaughtered a sheep when we arrive for holidays in honour of us passing our exams and when we left. I remember my mother’s excited face like a small child opening the white mealier meal packet that held our share-a hind leg. Mama:Usiphe ntoni utata kule gem? Me:Umlenze mama. How remembrance is, remind me, and I will remember. “umteyo”, through his fire lit shadow. because we were sissies for being lost, we disturbed his rest as he had to search for us. Oh how I remember, sweet precious blessed memories. Melancholic ought to be added to the list of feeling words. I got goose-pimples from the language for oh! how vivid some of those images were…I even had one of my “why don’t I move back?” moments a third of the way through and now I feel called upon to write a poem of my own titled ‘Gatwick can wait’! Mahle mangcwengile Mzali ayacaca aphuma kwiNtombi yakwarharhabe, Nzala ndini yakwaPhalo. Mxhosa ongangxangwanga huntshu qhubekeka neMpumelelo yakho, inganqandwa nazi Nkanyezi ntonje inqandwe lizulu lesithathu phezulu. 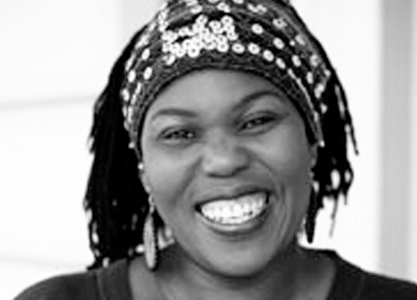 Andrea is cultural activist, writer, storyteller and award-winning actress, having worked extensively in theatre, radio and television, as well as being traditional Xhosa praise singer (imbongi) and bead craft artist. She began Human Movement Studies at the University of The Western Cape and later completed a Drama diploma at the New Africa Theatre. Some of the highly successful professional productions she’s featured in are Beading my Soul in collaboration with The Mothertongue Project, Dancing 2 Patterns and Good Heart at the Baxter Theatre and Romeo and Juliet, Ufeziwe okanye Inkohlakalo, Giants and It’s My Life at the Artscape Theatre. Andrea also facilitates storytelling workshops for adults and children’s programs at various national festivals. She featured in international movies such as The Final Solution and The Piano Player and landed parts in local television series such as Big Okes, Backstage, Madam and Eve, Thetha Msawawa, The Ringmaster, Stokvel, Unchain my Heart, Home Affairs making her a household face and name in South Africa.